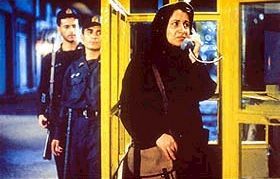 This beautifully well-made film continues Iran's tradition of effective yet grim dramatic films featuring mainly non-actors and capturing the earthy rhythms of life in this difficult country. This film examines the plight of women in an oppressive society, following a series of stories in a long, sweeping narrative arc starting with the birth of a baby girl (which sends the family into fear and gloom). From here we follow various women, one after the next, as they try to get through a system that is set up completely against them. All of these women have crossed the law in the past, and are just trying to keep their heads above water, against all odds. The desperation and helplessness is nearly overwhelming in the various stories, which blend together into one narrative and give us a startlingly clear picture of life as a second class citizen. It's almost as is each character is a separate part of one woman's life. This would be nearly unbearable if the film weren't so well made, if the characters weren't played with such authenticity and honesty, and also if the film was any longer than it is. Harrowing, haunting and depressing, the film is also rather preachy, but with good reason! Panahi tells his story with long, complicated takes that draw us into the scenes emotionally and intellectually, moving the story along in real time. He brilliantly captures the spark of human spirit in these characters as they struggle against the immovable forces and double standards of their culture. It's absolutely stunning--not remotely easy to watch, but essential viewing nonetheless. Ashkan Alahyari Daghigh, Michigan: "This film is totally realistic, except for maybe it held back some for the sake of the audience. Last I heard, the movie is banned in Iran, probably because it awakens such feelings of hatred for this outlaw government that has corrupted our people. It portrays the struggle of several unrelated groups of women who just happen to cross paths at various times. They portray the complete helplessness of the women through such oppression! An excellent movie! I am a guy, and I rarely get emotional in a movie (the only few happen to be Persian movies), and I got very emotional in this movie. Most Iranian movies are from the point of view of a guy. Everyone should see this in order to see the struggle to simply survive from the point of view of a woman, whose struggle is much greater than that of a man, in Iran!"